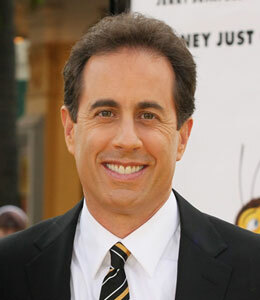 Is Jerry Seinfeld returning to his old NBC stomping grounds? Sweet fancy Moses, that's true! Jerry is producing a reality series called "The Marriage Ref," where a team of celebs help bickering couples work out their problems and get back on track. The show "will feature opinionated celebrities, comedians and sports stars who will candidly comment, judge and offer different strategies for real-life couples in the midst of a classic marital dispute." Seinfeld stresses the series is a comedy show, not a therapy show, not that there's anything wrong with those.